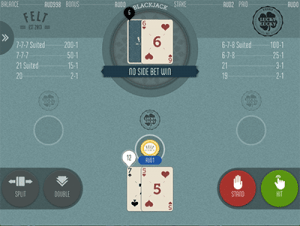 Land-based blackjack is quite straight forward with traditional gameplay mostly available, with a few variants on offer. 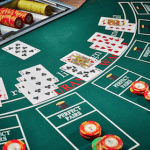 Online casinos offer a huge variety of blackjack games with differing format, rules, and gameplay and it can be hard for a player to find the best title. We list the 10 most popular blackjack games available online so you can focus on mastering the basic strategy instead. Microgaming offers a Classic Blackjack variant in both standard format and in their Gold series with the latter offering better graphics. Both offer traditional gameplay and if you play the perfect basic strategy you can get the house edge as low as 0.13%. It is the ideal title for pure blackjack enthusiasts and you can find it at various international online casinos with table limits ranging from a minimum of $1 and a maximum of $1000. 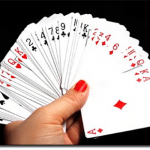 One standard deck of 52 cards is used and the dealer has to Stand on a Hard 17, but Hit on a Soft 17 or less. 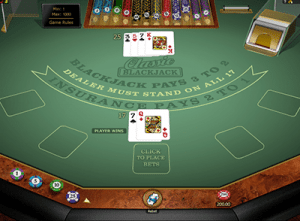 The player automatically wins with Blackjack, with a 3:2 payout, while it is a push if both player and the dealer has Blackjack. Evolution Gaming offer a huge range of live dealer table games including live blackjack. The best option is Live Blackjack Party due to two dealers being present creating a lively atmosphere, the low stakes available and the ability to always be able to place a wager. Evolution Gaming’s Live Blackjack Party offers stakes as low as $0.50 for the bet behind wager. This sees players betting on the hands of the players who are seated at the table and up to 500 players at once can participate. Seated players – there’s seven seats available at any one time – can wager on the game, with American rules in play and a minimum of $5 and a maximum of $1000. The dealer must Stand on all 17s and Blackjack pays 3:2. There’s also a chat box you can make use of – players can chat to each other while the dealers will respond verbally. Atlantic City Blackjack is incredibly popular and for good reason – with optimal play you can get the house edge down to 0.38%. While this isn’t as low as Classic Blackjack by the same provider, due to the eight standard decks, it has extra gaming additions including Re-Spitting up to two times, Surrender and Insurance – perfect for experienced players after something different. The game comes in both single player and multi-player formats allowing you to place up to five hands at once. Mobile players should try this title out as Play’n Go design their games with smartphones and tablet gamers in mind. The game is played with six standard decks and follows European blackjack rules with a house edge of 0.63% when the perfect basic strategy is used. 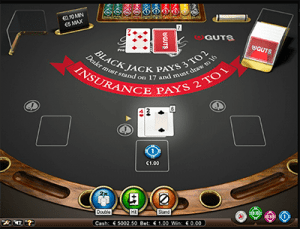 Blackjack pays 3:1 while standard wins pay 1:1 and insurance is available, paying 2:1. You can play up to three hands at once on the title, with a minimum of $1 and a maximum of $100 available. If you want a traditional blackjack game which looks as good as it plays, then opt for this title. It features 3D graphics and card animations which really adds to the overall gameplay. The house edge when playing the perfect basic strategy is 0.40% and up to three hands at once can be played. There’s just four decks in play and limits range from low, mid, to high including $0.10 to $5, $1 to $40 and $25 to $500 tables at Guts Casino. NetEnt doesn’t offer a huge catalogue of live dealer variants, but high rollers will be happy to know the provider does specialise in high stakes live dealer blackjack called VIP Live Blackjack. You can find high limits of up to $5000 at some online casinos as a VIP and see these limits increase – or contact the online casino for larger limits – as you climb up the levels. There is a limit of seven seats at one time, but there’s usually seats available. Microgaming offers a European blackjack game with an additional side bet to making things even more exciting. This side bet wagers on whether the first two cards will be higher or lower than 13, with a payout of 1:1. If you manage to wager on and get 13 exactly the payout is 10:1. Two decks are in play and the house edge for this title is 0.5% when playing the perfect basic strategy. You can find Microgaming’s Blackjack Hi Lo Gold on the downloadable version of All Slots Casino. Felt Gaming have quite a few popular blackjack games and all have the same house edge for the base game of 0.37% – each with six decks in play. When it comes to the side bets on these games, the Lucky Lucky side bet offers the lowest house edge at 3.95%. You can only make the side bet if you make a base game bet, winning if the first two cards and the dealer’s up card equal 19, 20, or 21. The minimum bet available is $0.50 and the maximum is $500 – maximum of $250 for the side bet. You might have noticed there’s a huge range of Felt Gaming blackjack games with different side bets – as we mentioned above. But if you can’t decide which title to play you can opt for Felt’s 6 in 1 Blackjack title as it offers the chance to place all of the six side bets. You can also play up to three hands with each side bet also eligible to be placed for these titles. The side bets available include Lucky Lucky, Ladies Luck, 21 + 3, Perfect Pairs, Buster, and Suit’em Up. You can find the game online with the table limits of $0.50 to $500 – maximum of $250 for the side bets. 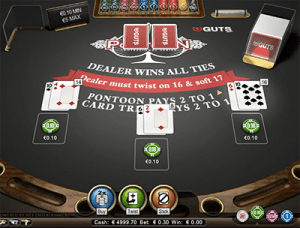 Pontoon by NetEnt shouldn’t be mixed up with the land-based variant found at land based casinos – it is a completely different game. This version is quite similar to blackjack with six regular decks in play. What makes this title different from standard blackjack is the addition of the 5 Card Trick, which offers a 2:1 payout if you create a five card hand totalling 21. Stakes range from low, medium to high with tables available from $0.10 to $5, $1 to $40 and $25 to $500 to suit all player’s and their bankrolls. You can play up to three hands at once on these tables too.